A stage musical adaptation of The Prince of Egypt is finally in the works! Stephen Schwartz: [...] Then there are ongoing meetings and discussions about a possible movie of "Pippin" and a possible movie of "Wicked," and also DreamWorks has been talking to me about developing a stage version of "The Prince of Egypt." So it's a lot to juggle. YES! Please let this get made before Dreamworks implodes. Norm Lewis was King Triton in the TLM musical, right? I didn't like him at all in that, but he'd probably be better-suited for this. I'm not sure how closely this will follow the movie, but I could definitely see him as Rameses' father, Jethro, or one of the Egyptian priests. The full cast for the premiere concert reading has been announced. Here you can read interviews with the cast. 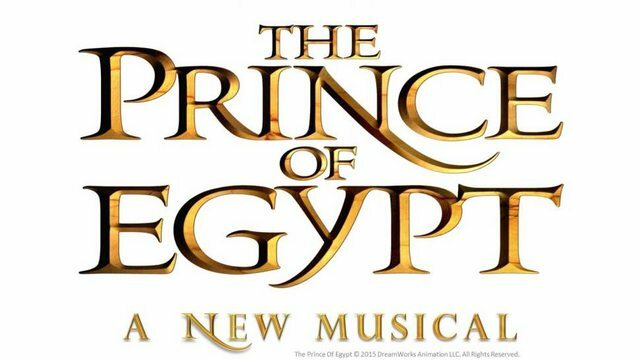 Bay Street Theater & Sag Harbor Center for the Arts is pleased to announce the full cast for the premiere concert reading of the first act of DreamWorks Theatricals new stage adaptation of The Prince of Egypt. This reading is part of Bay Street Theater’s 24th Annual Summer Gala which will take place in Sag Harbor at the Long Wharf on July 11, 2015 to benefit Bay Street’s educational and theatrical programs. The Prince of Egypt features book by Philip LaZebnik (writer of Mulan, Pocahontas) and music and lyrics by Stephen Schwartz (composer of Wicked, Pippin, Godspell); both authors will be attending the Gala. Bay Street’s Artistic Director Scott Schwartz will direct the reading, Dominic Amendum is Musical Director, and casting is by Stewart/Whitley. The special concert reading will feature Broadway and film stars, as well as local talent, including Matthew James Thomas (Pippin, Spider-Man: Turn Off the Dark) as Moses, Aaron Lazar (The Wolf of Wall Street, This Is Where I Leave You, J. Edgar) as Ramses, Tony Award winner Patina Miller (Pippin, Sister Act, Madam Secretary) as Tzipporah, Norm Lewis (Scandal, Porgy and Bess, Phantom of the Opera) as Jethro, Stephen Bogardus (West Side Story, Les Miserables, Man of La Mancha) as Seti, Julia Murney (Wicked, 30 Rock, The Wild Party) as Queen Tuya, Kyle Barisich (Phantom of the Opera, The Following) as Aaron, John Treacy Egan (Jekyll & Hyde, The Producers, Nice Work If You Can Get It) as Hoy, Ryan Knowles (We Will Rock You!, NEWSical: the Musical, Radio City Christmas Spectacular) as Hotep, Joanna Howard (Peter and The Starcatcher, National tour of Les Miserables) as Nefertari, Julia Motyka (Travesties,Richard III) as Miriam, and Anna Schiavoni as Young Miriam. Along with the thrilling principal cast there will be a large chorus of local performers led by Choir Master Greg Wilson. The chorus includes: Gary Ducoihy, Marquez Catherine Stewart, Nataliz Fulqieri, Vivian Grizzle-Jaber, Pattiz Hulmes, Courtney Kossick, Matt Luca, Austin Myers, Elizabeth Oldak, Ariana Pazz, Katzlyn Piotrowicz, Zack Reily, Sarah Soltysik, Marquez Catherine Stewart, Matt Tursi, Amanda Tuscorella, Carlton Welsh, Christian Wern, Michelle Wern, and Greg Wilson. Of course the actors playing Egyptian characters (plus Moses) are white. Judging the reactions to certain biblical films, that's totally not going to piss anyone off at all. I can definitely see Norm Lewis singing "Through Heaven's Eyes" though. Stephen Schwartz talks about writing new songs for the stage adaptation and notes that it's unlikely the production will ever reach Broadway. The musical is still being workshopped. Here's the logo for the production. The stage production is using 5 songs from the movie (I'm hoping "Playing with the Big Boys" is the one that got cut) and adding 12 new ones. Q: Let's talk about the reshaping of The Prince Of Egypt for Broadway. What goes into bringing an animation like that to the stage? Stephen Schwartz: First of all, the person writing the book for this adaptation, Philip LaZebnik, was one of the screenwriters. We’ve worked together before and we've actually done another project besides. We both worked together on the movie, so basically, the two of us sat down and went through the structure of the movie, talked about what we thought we could achieve, what we would need to change to work onstage, but also for the stage as opposed to an animated feature first of all it's longer, it's a two-act structure, you have the chance to go into the characters and situations in a great deal more depth, plus the stage musical will have a lot more songs. The movie had six songs in it, five of which we are using in one form or another in the show, and then I think there may be another twelve or so new songs. There's quite a lot of music in it. Those songs have to be written, and then one goes through a development process of hearing it read and making adjustments with notes from the director and the DreamWorks folks, then putting it on its feet in a kind of staged reading or workshop situation and learning from that, eventually leading to the point where we feel it's finished and can go out into the world. I hope the fact that they're collaborating closely with Dreamworks on this means that we'll finally see Prince of Egypt on Blu-ray. It's a damn crime that this movie can't be bought in the quality its visuals deserve. The musical is at least proving that Dreamworks isn't mistakenly trying to bury the film. The logo of the production. Q: What are some future endeavors we can expect from Bay Street? 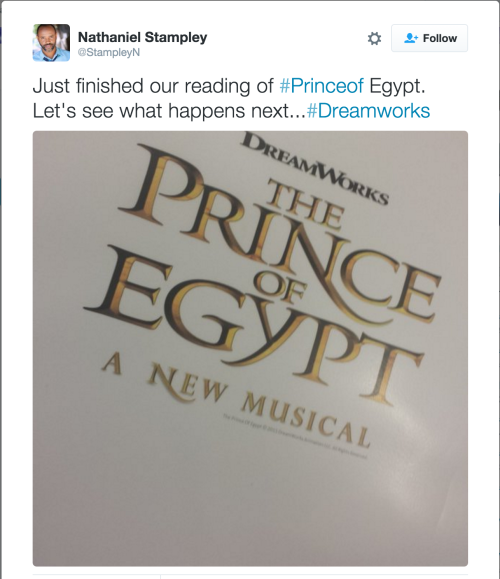 Scott Schwartz: This summer, instead, we are going to be doing a free concert premier of the stage adaptation of the musical The Prince Of Egypt. This is going to be the world premier concert where the full show and full score is presented for the first time. I have been developing this for a while, so I am very excited about this. That is on August 13th and it is an amazing piece. And what better way to premiere it than outdoors in nature - since it is a story that takes place in nature - and on a wonderful summer night in Sag Harbor. Is this still happening or what? It already happened. It played in Denmark, California, and Utah so far. It's not coming to Broadway if that's what you're waiting for. Sorry. Someone on another forum asked a question about who Norm Lewis is and I was going to reply "He was in the Little Mermaid and Prince of Egypt Broadway shows," but then couldn't remember if this actually came to anything or not. I don't believe they released a recording for the stage version, did they? At least I couldn't find anything on Amazon. I don't believe they released a recording for the stage version, did they? At least I couldn't find anything on Amazon. Unfortunately, a cast recording hasn't been released yet.